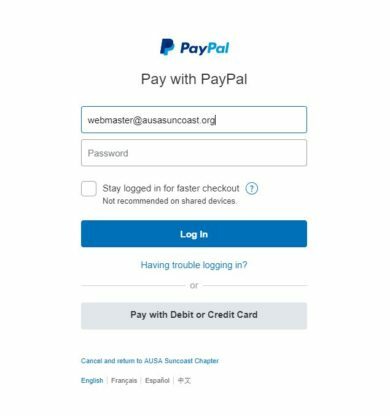 AUSA Suncoast Chapter uses PayPal to process all of our online payments. This allows us to maintain the highest level of security when handling your sensitive information. Using PayPal as our credit card processor means that our site does not handle any of your sensitive information – instead PayPal, a secure and vetted online payment portal processes your payment via their portal. Typically when paying for a purchase using PayPal, members can pay with their PayPal account. However, we acknowledge that not all members may have PayPal account and would prefer to pay using their debit or credit cards. PayPal does accept payment with debit or credit cards, although it is not always immediately obvious how to do this. We have put together this guide to walk you through paying with a debit or credit card on PayPal. You’ll note that below the Log In button is a Pay with Debit or Credit Card button. You can click this to go to a credit card form, which should auto-fill with the information you used previously on our site. Once you have completed the Debit or Credit card payment form on PayPal, you can click the Pay Now button. This will complete you order and return you to the AUSA Suncoast chapter website.